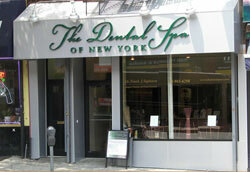 Dr. Sapienza and his team at the Dental Spa of New York value the opportunity to develop a relationship with patients. Of course, that’s not the only reason we enjoy your company! When you come to see us twice each year for a dental checkup, we’re better able to help you have a healthy and happy smile. Park Slope dentist Dr. Sapienza provides dental checkups that are thorough so we can develop a plan that is customized to your needs. At our dental office in Park Slope, checkups have two equally important components: teeth cleaning and a dental examination. Our dental hygienists are highly trained and skilled at cleaning your teeth to a sparkle. At the dentist office in Park Slope, we have special hand instruments that allow us to gently remove surface stains from your teeth. And while we know that you take good care of your teeth and gums at home with daily brushing and flossing, there’s really nothing like a professional cleaning to leave your mouth feeling refreshed. During a dental examination, we take the time necessary for a close and careful look at your teeth, your gums and your entire oral cavity and throat. The dental hygienist and Dr. Sapienza will examine each tooth for the early warning signs of tooth decay, such as a white or soft spot in the enamel. We’ll also use digital x-rays to locate cavities that may be developing in between teeth or just below the chewing surface. Found early, these small cavities can be quickly and easily repaired with tooth-colored fillings. As your teeth are examined, we’re also on the lookout for cracks as well as worn or loose fillings. To gauge the health of your gums, the hygienist will use a small probe to measure the depth of gum pockets. These are the areas that surround each tooth. If they are too deep, then this may be a sign that gum disease is developing. The early stage of gum disease is called gingivitis and is also recognized by gums that are swollen or that bleed easily when pressed with a toothbrush or floss. If you have gum disease, then periodontal therapy is essential to stop the progress of this bacterial infection that can ultimately lead to tooth loss. If it’s time for your six-month dental checkup, call the Park Slope dental office that more people trust. The Dental Spa of New York serves friends and neighbors from Brooklyn Heights, Cobble Hill, Prospect Heights and Carroll Gardens and other areas of Brooklyn and Queens.